I’m still getting used to my freelance life so things have been super sporadic on all fronts. Every day is different which has been a blessing and a curse but I’m enjoying the ride. So for today, in the spirit of shop small Saturday coming up (gift guide and how I keep a level head during holiday shopping coming soon! 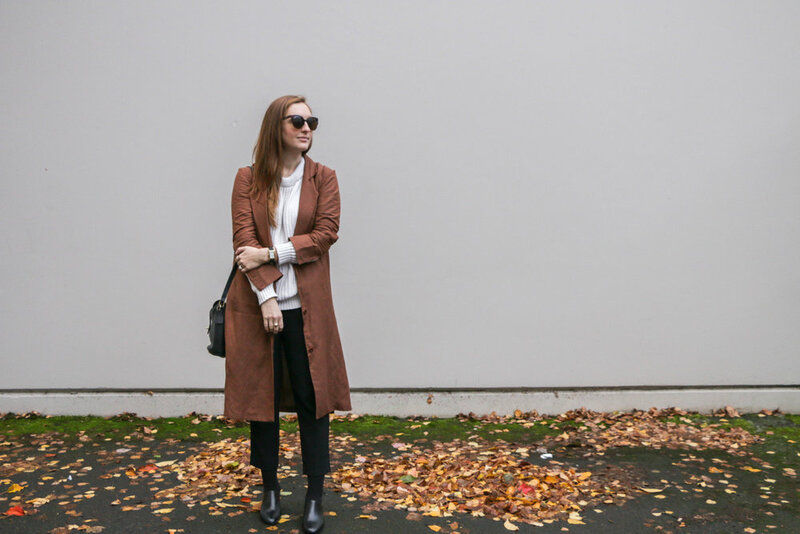 ), I wanted to introduce you to an online shop that I’ve been following for the past couple months and share how I styled this first rite trench coat which is available on their site! Plus there is a sweet little gift for Thoughtful Closet readers down below so let’s get started! At the heart of Belvele is sustainability. Their mission is to support independent designers that share their same values which is what drew me to this online boutique. Belvele is owned by fashion industry veteran Monica Rojas. Monica first became interested in sustainable fashion after the collapse of the Rana Plaza garment factory in 2013. Since then she has put all of her efforts into curating a beautiful collection of ethical designers so that she can share a new way of shopping with her community. Belvele has also recently launched a new rewards program where you can earn points when you make a purchase, share Belvele with your friends and you can even earn extra points for your birthday! You can learn more about the program details on their site (earn rewards icon at the bottom of the page). Belvele is graciously offering Thoughtful Closet readers $50 off their purchase of $100 or more, even sale items! Use code: THOUGHTFUL now through 11/19! 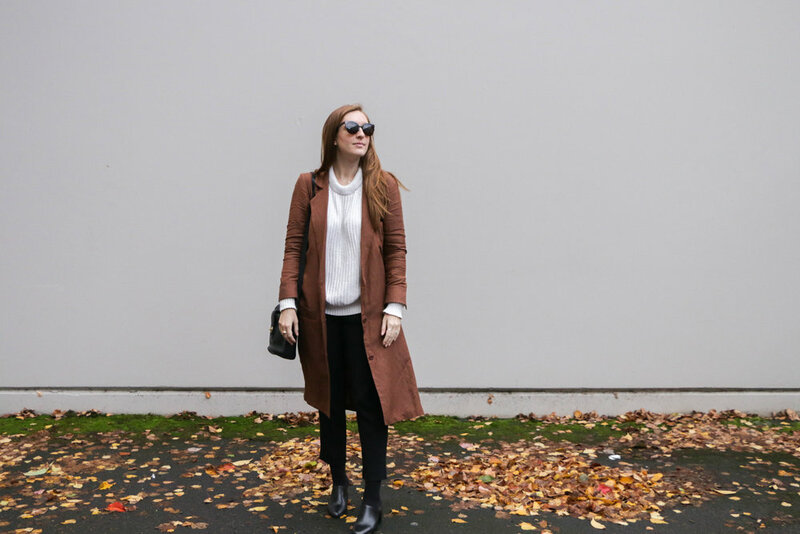 Long duster coats have been my coat go-to this fall. When I saw this First Rite clay duster I knew it would be a wonderful addition to my closet. I've loved layering it over chunky sweaters and turtlenecks. I love how it brings a warm element to this outfit. It makes the overall look feel more casual and relaxed. Plus the mules + socks combo is quickly becoming my favorite. | LIGHT LAYERING | It is so hard for me to dress with fluctuating temperatures. I find that I either dress too warm or too cold. However, I've started to figure out a balance with my layering. I like to layer a lighter long coat/jacket with a warm oversized sweater. The length is a nice touch for when it gets windy and my legs want to be a little more wrapped but the material isn't so thick that I sweat while I run around and do errands. Balancing light and warm pieces is definitely critical to stay a nice cozy temperature. | CLAY ACCENT | I'm obsessed with the color of this trench. It's a little step away from my cognac obsession but is still in the same family. It also works so beautifully with all of my cream and black pieces. It's nice to have a little switch up in my color scheme that still feels familiar. | OUTFIT FORMULA | The focus point of this outfit formula for me is really the crop pants + socks combo. After my fall 10x10 temps seemed to drop even more and I was finding it harder and harder to let go of my crop pants. So I decided to try out the sock/tight thing first in this look and I love it. Seriously almost all of my outfits either have socks or tights showing now. If you're hesitant on putting your crop pants away seriously try it out. It might not be for everyone but you never know until you try! I would wear this over a long sleeve turtleneck with black opaque tights, white sneakers and an oversized duster coat in the winter then sandals and a beach bag in the summer! I can just picture this dress with opaque tights, ankle boots and these statement earrings for a holiday party! All fall I've been craving bright cream/white accents. I love this coat for its' dramatic statement and it would carry over beautifully into spring. See you guys soon, I promise, and until then go get cozy with some coco or coffee on me.